divide up in a year or two as well. way of maintaining fencelines without a lot of work or chemicals? 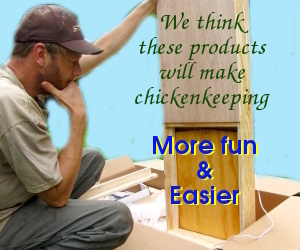 waterer that makes chicken-keeping fun. Subject says it all. Goats are great at keeping weeds down. And anything else that grows. And your fences too, given half a chance. We’ve already lost two apple trees, had several holes in our fences, and repeated break outs. I love our goats, but they’re a handful. They’re cheap to feed, and give excellent milk, but costly in terms of fencing (you either pay for a fence that can keep them in, or you pay for the damage they can do if they get out). Either way, they do keep both sides of their fence squeaky clean. Rhesa — We seriously considered goats (or sheep) for that purpose, but building more serious fences seemed like a lot more effort than just patrolling for weeds ourselves. 🙂 We may still go there someday when everything else is under control and we’re ready for another big undertaking, but for now, I think we’ll stick to manpower. Nicolas — Interesting data point! I’m okay with this particular spot of comfrey not taking over the world if the chickens really like it. I’m glad I have another variety to compare it to, though.